Shapeways have another interesting 3d printing wizard application on their site. Called the Vibe. As you will see form the video it is a mash up with Soundcloud. You pick your favourite music and isolate part of the waveform, that is then printed in relief form on an iPhone case. Are you into CrowdFunding and 3D Printing? Now the project is looking to reach its next level with a crowd funding model to get more support. Check out the Anarkik3d IndieGoGo project sitting there ready for you to invest. There is a new website too for http://www.anarkik3d.co.uk/ yes that is a UK startup for 3d design and printing. The founder is Ann Marie Shillito, an internationally renown designer maker and contemporary jeweller. At Edinburgh College of Art, she instigated and led the original research into the effectiveness of a haptic interface for a 3D modelling package for designer makers. (As her bio say on the website). Ann Marie knows what works and so this makes it a very different modelling packages. Anyway, it has been a deep and enjoyable experience. Very varied within it’s context. Hugely time consuming. That is were I felt I had to bring in the notion of variety. Yes it is just a game, like other forms of entertainment are just books, or just films. It requires a lot to get into and continue it, and unlike many networked games it is a single player experience (generally though that is changing, and the PC version has a Mod kit to build your own pieces). Just as I was finishing this behemoth of gaming the follow up to Trials HD, called Trials Evolution arrived on Xbox Live. This game cost about £10 as a download, rather than the £45+ of Skyrim. It is “just a motorbike game” Anyone who has played Trials HD, or knows of the old Kickstart game will know it is a fantastic flexible physics puzzler at it’s heart. You control a motorbike, in a side scrolling left to right environment. You balance throttle, brake and leaning forward and backward to try and traverse the terrain as fast as possible. 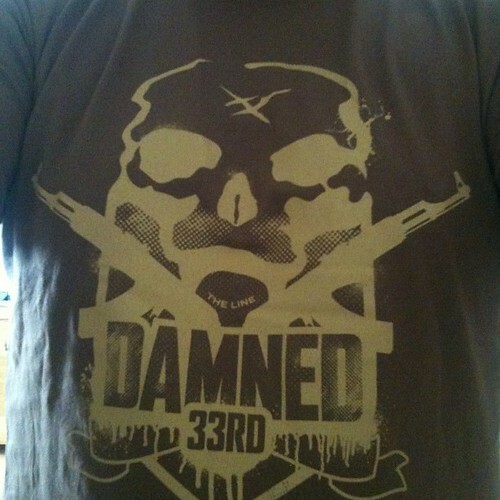 The original was fantastic, infuriating and rewarding in equal measures. This evolution has the same attributes and also some extra variety carried over from the previous game with odd sports challenges. It also has a course constructor. On top of all that it also has head to head online super cross racing. The online experience has a great asynchronous version too. Whilst racing any track you fastest friends times are represented by little social dots (rather than full on ghosts) showing how far behind you are. So playing alone you feel connected. Where the real surprise is though is that this “it’s just a motorbike game” which stands well enough as it is has an incredibly varied editor. It is not a simple course constructor to just place the odd ramp. No, the things people are creating are 2D top down shooters, FPS games, Table Football(Foosball) and who knows what else will appear. All of these creations are appearing online as part of the games youtube like connection lobby. In the official trailer you can see some of these pop in, check about 50 seconds in here, almost as a throw away statement! Giving people tools with which to create, where they can completely turn the original game on its head is very exciting. As with Little Big Planet, Minecraft and alike we are going to see an explosion in ideas. This gets people exploring how to integrate assets, respond to events etc, it is a form of programming and problem solving. It is very exciting! 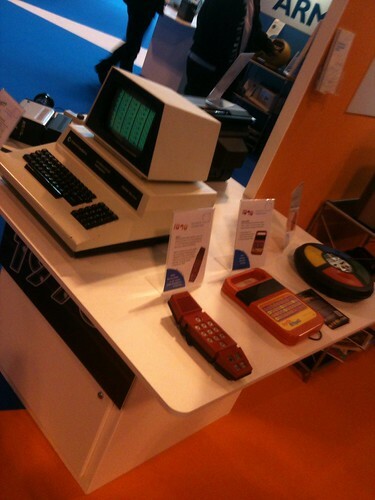 Last week I popped along to Gadget Show Live Professional. Which is otherwise known as the press day. It seemed much more spaced out in layout this year compared to last year, yet it also seemed to not have quite so much in despite being across more halls. Being a pro day there is less barracking from people on the booths as really its a rehearsal warm up day. Also the flagship live show is doesn’t run as the team are still putting it together and doing dress rehearsals. There was nothing that leapt out at me this year, but it may be that I spend so much time with new technology it takes something pretty amazon got get the attention. 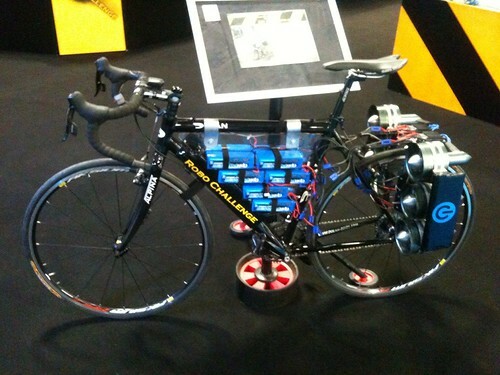 Things like the electric “jet” bike and Jason’s robot martial arts training dummy were on show. 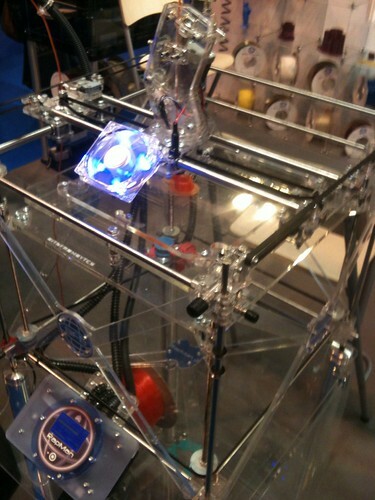 It was also great too see at least one 3d printing company there. Bits from Bytes. So we had a bit of chat about printers and building your own. Of course I could have stayed at home for a touch of retro as I found opening a few old boxes. 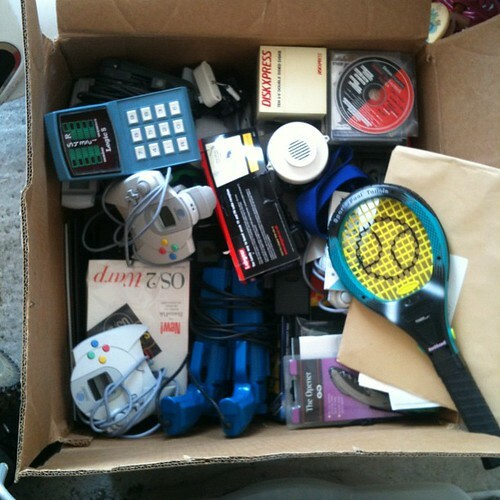 A logic 5 and some Dreamcast controllers, and a copy of OS/2 Warp ! Still in its shrink-wrap. The screen rise out of the desk like Ozzy Osbourne’s TV used raise out of the foot of his bed. 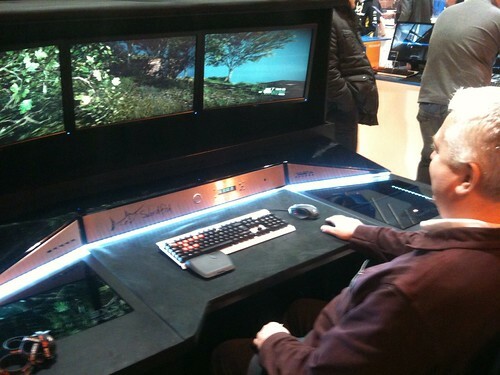 It was part of a massive gaming rig with more graphics cards than Dreamworks office! Anyway, it was a good show, but it was showing the recession was in effect I think. You might aswell look at the bustling film I made from last years. This year just didn’t really warrant the vid. Teaching Programming and Tech at School – Can I? We are seeing more and more good articles and the beginning of some motion towards us being able to teach kids programming and related technical skills in school. Things such as this article from the guardian. We see role model comments and I was also doing my bit by introducing all sorts of accessible future tech on kids TV. However I thought I would look at me doing a bit more, I have already signed up as a STEMnet ambassador and I do a lot of talks for people. People have often suggested and commented I would make a good teacher. So I thought with all this need for experience, technical awareness, future thinking I would see what options there might be for me to move into teaching. 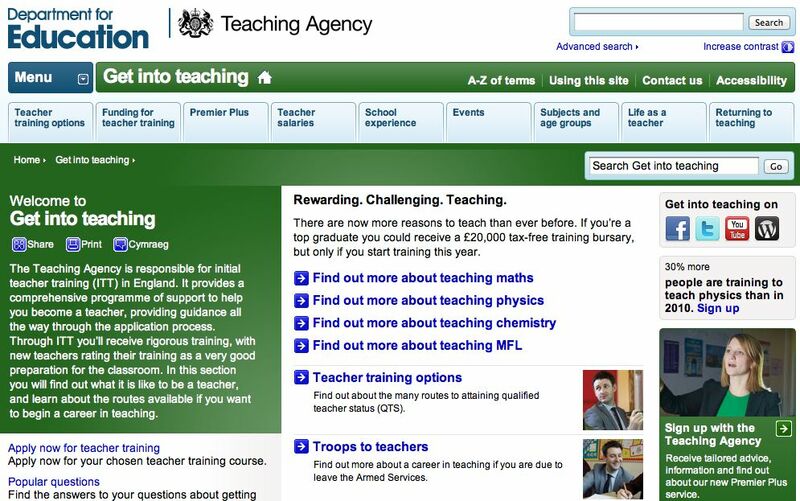 Surely, all this talk of closer links to industry, bringing experience into the classroom etc would be there on the home page of the Department for Education Teaching Agency? But no 🙁 Good encouragement to be a Maths teacher, A physics teacher, chemistry or Modern Foreign Languages (MFL). All good subjects. 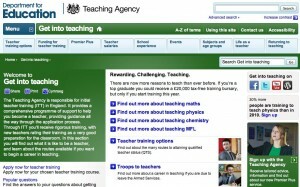 Also active encouragement to convert to teaching from the armed forces. Nothing about the business of powering and using technology. Now most subjects do need to use tech so it could be excused as all this will be part of the entirety. However the specifics of computer science are not represented well or at all. So which teachers are going to be the ones showing kids about open source projects, online etiquette, contributing to projects, building hardware with arduino, rasperry Pi, creating virtual worlds with OpenSim, games design, virtual good markets, social implications of computing etc…. Who are the teachers who are helping the next generation of makers with 3d printers? I am sure it will come, but right now it is not there in any official capacity. Should I try and create it ? or wait until called? Maybe I need to send someone a Fax to ask? Another year passes! Certain milestones in life act as reflective placeholders. When I started work full time in 1990 it would be unlikely to be celebrating, or even mentioning that you had been with an online service for any period of time. Computer systems were tools, things that you happened to use. You did not commemorate 2 years since your first email. However that was before we started to interact and have very deep experiences online. Interacting directly with other people, with personas, with environments. So it is now 6 years on I am able to happily shout that its my 6th birthday there. A lot has also changed out there too. For instance, this birthday snap was taken in Second Life, but then posted to the Second Life personal web profiles, then curated (the new word for shared bookmarking 🙂 ) on Pinterest. Where it is then disseminated to both twitter and Facebook. Our virtual worlds were never really supposed to be isolated islands in the digital landscape, despite the use of islands to represent server space in this particular metaverse. It was always about integration. The integration of our thoughts and ideas with one another, mediated by rich digital channels. These environments, and the ones they evolve into and the new ones that get created are offering us richer and richer ways to meld our minds. Of course in the meantime we have to let everyone evolve their own digital persona through twitter, Facebook and now curation. Some forms of interaction become fire and forget, whilst others rely on conversation and personality. The great thing is we have lots of options, not one tool to communicate. Long may confusion reign. Not least so I can help people make sense of it as I find out for myself where this all goes. Constant change continues.